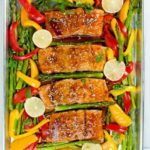 This Thai Chili Sheet Pan Salmon needs minimal preparation, is easy to clean up, and makes a healthy, flavourful supper all baked on one pan in less than 20 minutes. Preheat oven to 400°F. Line a sheet pan with foil and brush or spray with 1 tsp oil to prevent sticking. Trim tough ends of asparagus spears and slice peppers into strips. Slice lime. Arrange salmon filets on sheet pan and surround with vegetables and lime slices. Brush generously with Sweet Thai Chili Glaze, reserving 1/4 cup for basting. Bake for 15 minutes, brush with more glaze, sprinkle with sesame seeds, then broil for 3- 4 minutes. Brush with remaining glaze, garnish with more fresh lime quarters and chopped cilantro and serve immediately.